N.O.A (acronym for none of the above) distinctive watch design has garnered quite a following over the last 10 years, so much so that a competing watch brand bearing a striking resemblance sort of distracted some of N.O.A’s followers. This resembling rivalry amid the two brands may have led to N.O.A’s brief hiatus in turn fueling a strategic, so to speak, “going to the mattresses” design revamp for N.O.A, which led to its new limited edition Ghost watch collection. Whatever contributed to the design revamp for the Ghost watch collection, N.O.A has permitted only one of its five ghostly timepieces to dare make an appearance in broad day light – it is after all a ghost. Familiar of the N.O.A. Ghost timepiece is the round case and scalloped edge dial. The dial is recessed with an openworked skeleton revealing its mechanical craftsmanship. Lumed hour markers surround the dial making it very readable thanks in part to its open-framed hour/minute and seconds lumed-tipped hands. The watch movement is Swiss Made as is the watch. As mentioned earlier N.O.A manufactured five watches in the Ghost Collection all of which are limited editions. At present details about the watches are scarce; however, the watches will make their ethereal appearance at BaselWorld 2013, April 25 – May 2, Hall 2.2 – Booth C33, where all the details will be revealed including available quantities and prices. Eerie about the revealed N.O.A Ghost timepiece is its skull in the center of the dial, which has a similar likeness to that of the skull in the movie “The Punisher,” which begs to asks, “Is there a subtle message being inferred to N.O.A’s competitor?” I’m just saying. Swiss watch manufacturer MB&F have recently produced an update to their Horological Machine No. 4 (HM4) series, dubbed the HM4 Final Edition. This wristwatch doesn’t exactly look like a watch at first; it more resembles something James Bond would wear to perform some incredible stunt. The Final Edition is crafted out of black PVD-coated high-tech titanium and a sapphire center, which requires an astounding amount of work, more than 185 hours of machining and polishing to create. This is the only way for the design engineers to bring a solid block of opaque crystal to such extraordinary visual complexity. The look for this timepiece was inspired by three distinguished aircrafts of the golden age of aviation, the F-117 Nighthawk jet, the B-2 Spirit and the SR-71 Blackbird. MB&F pays homage to these planes through the sharp and very bold design to close out their HM4 series. The Final Edition’s most distinguishing feature is the two turbine-like pods (or perhaps stylized mini jet engines), one for the time and one for the power reserve indicators. These pods are connected to the power reserve through unique vertical gear trains specially manufactured by MB&F. 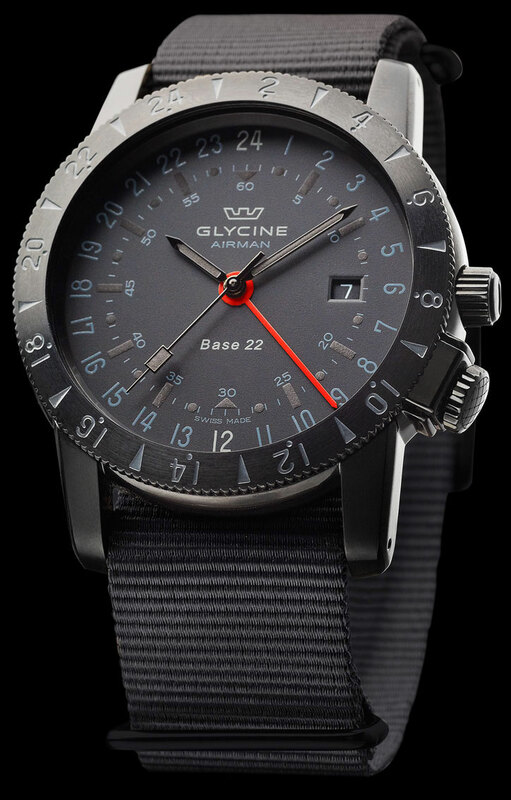 The Final Edition boasts a 311-piece automatic movement, which further contains dual configured mainspring barrels, which drive vertical gear trains for each display pod. The squared-off hoods lean over each pod to give the Final Edition a completely unique look and set it apart from the other HM4s MB&F has produced. Furthermore, each of the 311 components, down to the screws, were developed specifically for the HM4 Final Edition. Just like the jet it was designed after, the aesthetic features of the HM4 Final Edition are based on square angular shapes, top of the line titanium and matte black finished surfaces. The architectural base of the HM4 Final Edition is modeled after the previous MB&F watch called the HM4 Thunderbolt. With a 72-hour power reserve this watch will be extremely limited, with only eight units being produced. Each of these eight wonders are being priced at $230,000, and can only be found in five boutiques worldwide: MB&F’s M.A.D. Gallery in Geneva, Chronometryx in Gstaad, The Hour Glass in Singapore, Chronopassion in Paris and Westime in Los Angeles. So getting your hands on a Final Edition may be something like a world-class scavenger hunt, as well as a race against time as many watch enthusiasts may be after this eccentric yet bold MB&F watch. 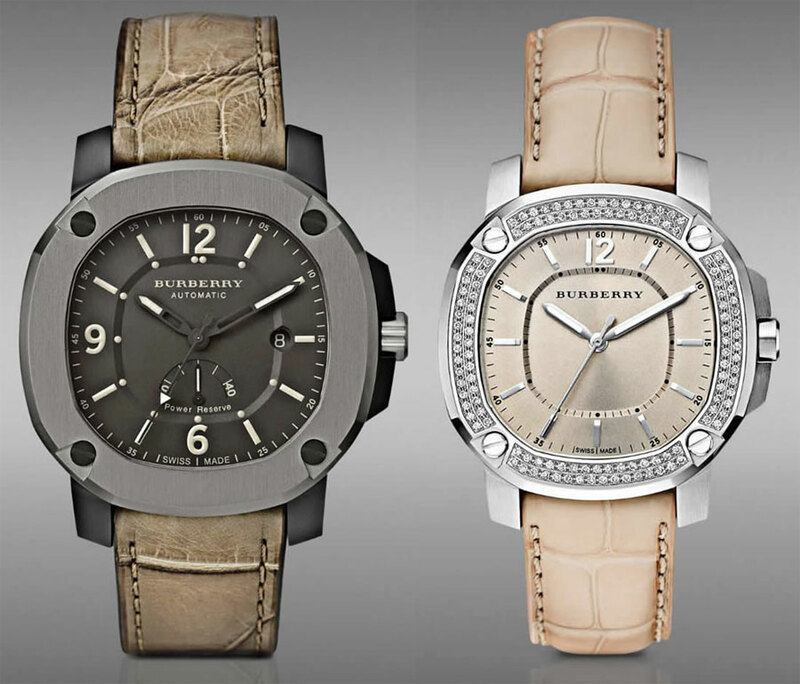 “Multi-faceted” is perhaps the best way to describe Burberry’s new direction for their watch division, starting with their brilliant new Burberry Britain Watch. With subtle craftsmanship that gently reflects light and an artful blending of textures, the multilayered design of the timepiece is as rich as the history of the country itself. Heavily influenced by their popular trench coat design, the watch is held to the same high standards as the outerwear that first made Burberry famous. Their expertise in design translates through the texturized leather wrist strap captures the classic colors of the coat (though you can opt for a metal bracelet if you prefer). The hand-stitched strap is slightly distressed, offering a nice counterpoint to the textured finishing of the watch case. The case of the timepiece is also worth mentioning. The octagonal case with a vertical brushed finish adds a militaristic feel to the piece, while the gunmetal case gently reflects the light off the piece. The gunmetal material ties in nicely with the subdued palette of the trenches, creating a fashionably distressed look. The dial is straightforward and simple, yet aesthetically pleasing. The dark watch face with luminescent indices will be useful in low light, and the watch features a power reserve indicator and date, incorporated seamlessly into the watch face. With a water resistance of 5 ATM (165 ft/50 m) the watch is ready to brave even the dampest London Fog while the shock-resistant sapphire crystal dial window and is also sure to come in handy as well. 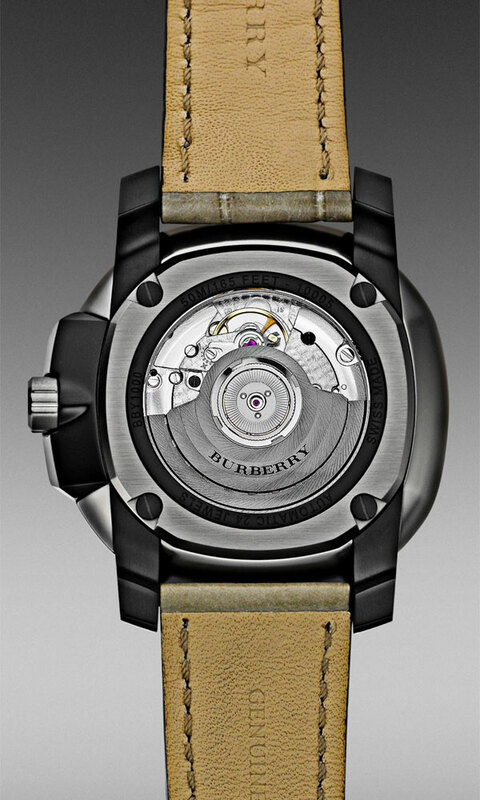 Burberry is beginning to take their watches a bit farther these days, changing out their standard quartz movement for the Britain Automatic Power Reserve—a Swiss Soprod caliber 9040—in their standard version. The Britain chronograph still runs on a quartz movement, which is reliable, if not the flashiest of horological movements. The Burberry Britain watch is finessed down to the last detail. The craftsmanship and masterful blend of textures along with a subtle, yet pleasing color palette will make this watch welcome in any watch collector’s home—or on their wrist. 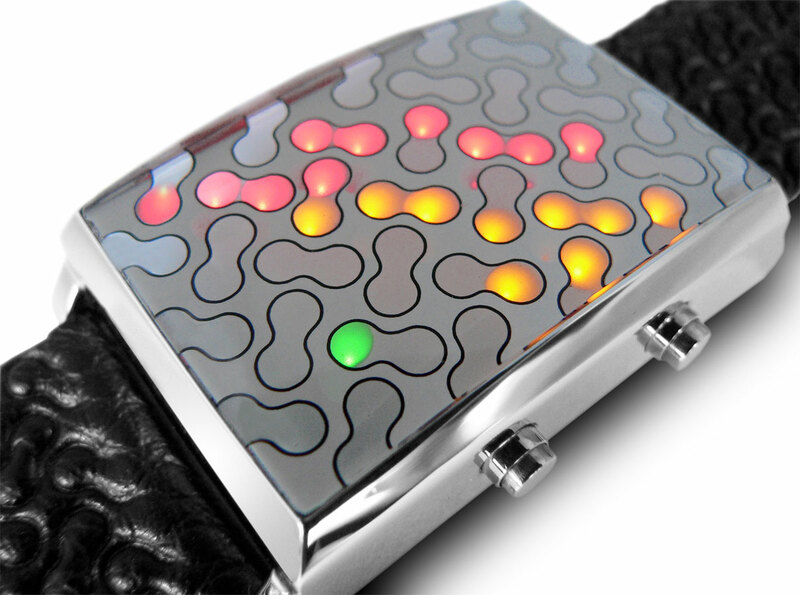 bezel, the human touch in the mechanics of the piece. It is the same dedication to craftsmanship that has made the company famous for its outwear, and who knows? 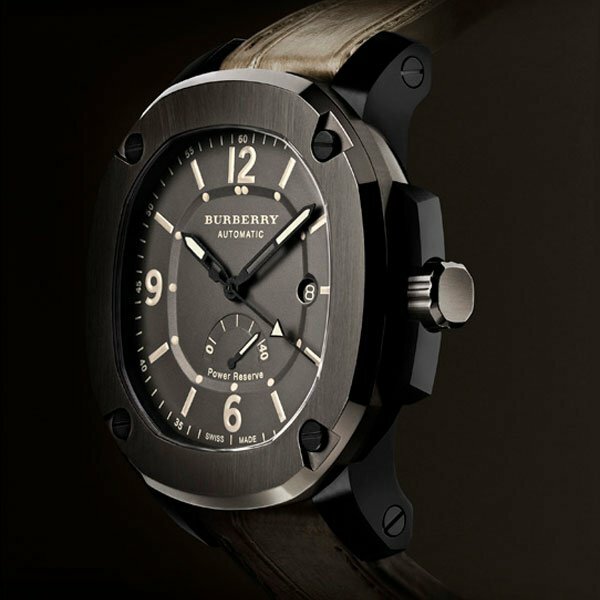 In a few years, Burberry may be as well-regarded for their watches as they are now for their trenches. Tokyoflash Japan would like you to change the way you think about time. The Japanese watch company based in you guessed it, Tokyo, has been in the business of creating one-of-a-kind watches that display time in the most unconventional ways. Founded in 2000, Tokyoflash watches display the time with LED and LCD displays making telling the time most interesting and cutting edge. Tokyoflash’s collection of watches offers so many different types of watches from round to rectangular faces and tons of different displays and colors. 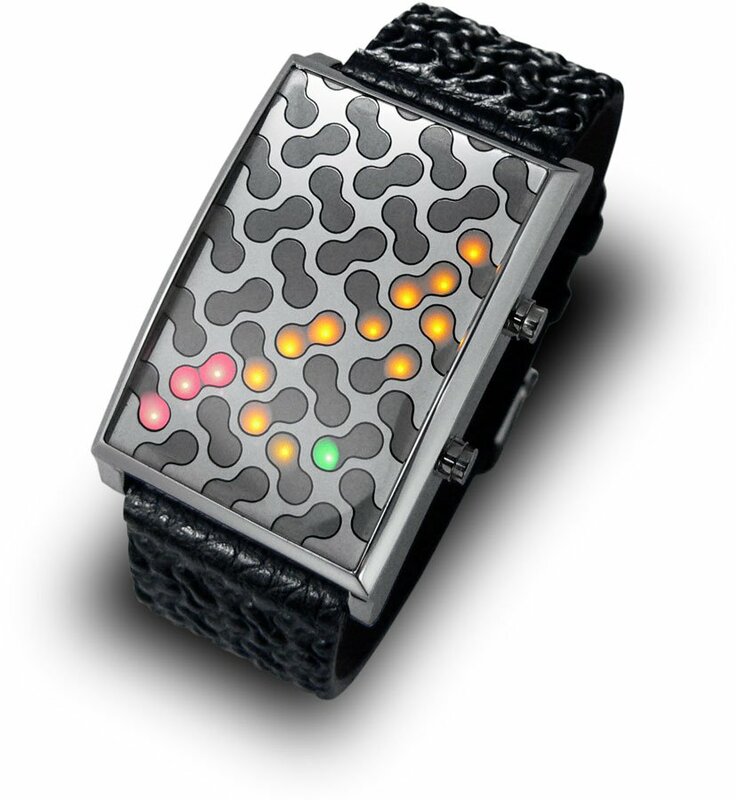 One of the most eye-catching watches in Tokyoflash’s repertoire of timepieces is the Infection. While wearing this watch won’t cause you any ill effects, the style and free spirit displayed in the watch is truly infectious! The Tokyo Flash Infection LED Watch is ergonomically designed to provide a comfortable fit to show off your smart and futuristic watch. The Infection features one of the most interesting time displays you’ll ever see with twenty seven multi-colored LED lights shaped like cells, pulsating and traveling across the face of the timepiece all below a striking reflective mineral crystal lens. The Infection comes fashioned with a genuine black leather strap that perfectly complements the sporty look of the watch and really ties the look of the watch together. The timepiece measures 30 millimeters by 42 millimeters and is water resistant to 3 ATM. While the various colors displayed on the case of the watch appear arbitrary and merely just for looks, there is actually a method to this madness. Infection’s case features three different colored LED lights. The twelve red lights indicate the hours; the eleven yellow lights signify the movement of time in clusters of five minutes and the four green lights represent single minutes. There are two buttons on the watch with the upper button allowing you to access the LED lights and the lower button which shows the time on demand. The Infection retails for $165.02 and is currently sold out on the Tokyoflash website. All in all, the Infection is quite an impressive watch. Some might think it’s just a gimmicky watch but for those who enjoy distinct displays and watches that offer more than a stuffy luxury watch, the Infection could be your perfect match. Affordable, attention-grabbing and trendy without looking like you’re trying too hard, the Infection makes an ideal accessory for both work and play. Don’t fight the infection, like Tokyoflash says, no one is immune to Infection.